Snappy is a remarkable little screen capture tool which beats many of the shareware programs, hands down. It offers a dual-panel user interface which may remind you of an older image editing suite. The program packs in many useful features like capturing a region of the screen, making entire screenshots of your screen, many different color effects and more. What is also cool is the Windows Aero mode which will help you create better captures of windows you have open. Version 1.5.8 is a freeware program which does not have restrictions and it's free so it doesn't cost anything. 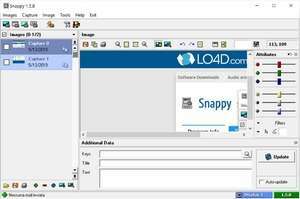 For security reasons, you should also check out the Snappy download at LO4D.com which includes virus and malware tests. Additional screenshots of this application download may be available, too.